Travel through these gates and you'll be a champion, or at least feel like one! Yes, we knew our golf game left a lot to be desired. Triple digit scores always generate excuses. That's why it was time for a joint "intervention". Yes, we both realized we needed to break bad habits and learn from a professional. We were always reluctant to expose our "failures" to others, but it was time … time for a David Leadbetter Academy lesson. It was "tough love" to suggest to each other that we spend three hours exposing our grip, stance, backswing and strokes to those much more accomplished at the game. Then, to find the strength to play 18 holes on the National Course immediately afterwards took extreme willpower. But it was necessary … to try out our new found guidance. The "easy love" though, would follow when we posted a good score and then retired (exhausted) to our first class accommodations at the Omni Orlando Resort at ChampionsGate. It is easy to love the facilities and amenities at the Omni . Float down the lazy river, relax in a private pool-side cabana or partake in one of the numerous spa services after touring the course. There's little that you can't find or enjoy at the resort. 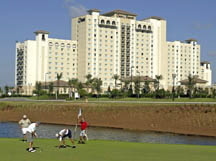 Luxury accommodations, two championship golf courses just a chip shot from the hotel lobby, the excellent golf academy, five restaurants and numerous amenities provide golfers and other visitors with several days' worth of activities. The resort's two golf courses, designed by Greg Norman, opened in 2000, and they truly offer a challenge to the novice and experienced golfer. The National Course, a 7 ,128 yard layout from the black tees (5,937 from the whites and 5,150 from the red tees) is the most player-friendly. Mostly flat, with only a little water to worry most players, the National meanders away from the resort throughout 200 acres of woodlands and wetlands. Hole #14 is often memorable to many players, a deceivingly simple par-3 which requires a targeted drive over a wetlands area. On the other hand, the International Course surrounds the Omni and numerous bunkers surround the fairways. It's also home of the annual Office Depot Father/Son Challenge, hosting the teams of Trevino, Ballesteros, Stadler, Kite, Nickalus and many others. At 7,363 yards from the black tees (6,239 from the white and 5,618 from the gold tees), this is the course where all golfers fresh from the Academy (or not) feel that their skills have been totally challenged. Our challenge began at the golf academy at Champion's Gate, but we didn't let ourselves be intimidated by its world-class reputation. The David Leadbetter Golf Academy at Champion's Gate is truly student-friendly for players of all levels. We participated in the 3-hour mini-school and it is well worth the $325 per person cost. With four students per teacher (plus assistant) we received plenty of individual attention. Our instructor, Bob Lohr, was very patient and thorough. He began our lesson at the driving range by observing our swing as we hit practice balls … numerous practice balls. Then, he filmed us from the side and the front in order to document everything from grip, stance, body and shoulder turn, head position, ball position and follow-through. Inside the adjacent Academy studio, we were shown a very detailed 10-minute video, highlighted with computer graphics to show a flat swing vs. a correct plane, weak vs. strong grip, etc. Our failures were exposed! For those of us who have to see it to believe it, the video was the most useful part of the instruction. Afterwards, the balls we continued to hit at the practice range showed remarkable improvement in their trajectory. The only casualties were our hands, blistering after hitting well over 100 balls each! While we only took a mini lesson, the Golf Academy also offers two and three day retreats as well as one, two and three-day lessons. The facilities are extensive, including indoor swing analysis units, an 8-acre short game practice facility with bunkers, putting and chipping greens and separate pitching areas with distinctive target greens and fairway bunkers. We received the video instruction on a CD to review at home and refresh our training lesson. Their follow-up also included a summary letter with reminders of the keys of the lessons. Specifics on grip, posture, setup and backswing modifications/suggestions were included. The nicely-appointed guest rooms at the Omni Orlando Resort at ChampionsGate feature the most comfortable beds in Central Florida, of course. There are also two phones (one cordless) with personalized voice mail, a huge safe which easily holds a laptop computer or cameras, a hair dryer, two robes and a lighted makeup mirror. Some upgrade rooms include balconies overlooking the beautiful pool area or gardens. Kids and adults alike can enjoy the lazy river, 850 feet of meandering moving water where guests can float on inflatables. Occasional water cannons and waterfalls keep even the most careful from staying dry. 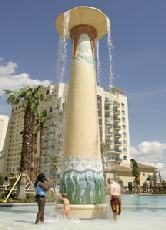 The lazy river circles the children's pool, where dancing waters and a slide also make it fun for smaller guests. 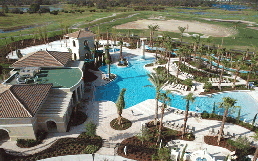 At the nearby "quiet pool" a scenic Jacuzzi and beautiful cabanas are some of the most relaxing and enjoyable features. The cabanas, available for an additional fee, include two chaise lounges, a television, a small refrigerator and curtains for privacy. The cabanas are excellent for those who want to enjoy the comforts of a private room near the amenities, and they are great for an afternoon nap in the breeze beside the pool! After a full day at the academy or on the golf course or lounging at the pool, you'll need nourishment. At the Omni Resort, you'll discover that there is no need to leave for several days, as numerous dining options exist right on site. Zen, the upscale Chinese restaurant, offers excellent sushi and a varied multi-course meal in a very enjoyable atmosphere. The food keeps on coming until you are stuffed. Our advice is to pace yourself! The every-day Ciao's Italian restaurant is open for breakfast (menu and buffet), lunch and dinner and offers indoor and outdoor seating. David's Club is a "man's man" atmosphere with sports bar & grille overlooking the International Course. Poolside, Croc's has a varied informal menu, and the ChampionsGate Clubhouse Restaurant is open during daytime hours. There's also a coffee house and a deli with a wide variety of quick snacks, sandwiches and refreshments. With all those opportunities, your energy level should be restored. An ample exercise room has the latest equipment, overlooking the gardens. While the spa facilities didn't offer the grandeur of most other facilities at the beautiful Omni, a variety of Spa Packages are available. Guests can enjoy everything from an inexpensive 25-minute eye care treatment for $40 to a multiple-hour massage and body treatment for $382. The steam sauna is relatively small and the locker room and showers are not connected, making it a little inconvenient for changing clothes before or after a treatment. The waiting room had a nice touch with a variety of teas and juice available. The accessibility of the Omni at ChampionsGate is hard to beat. Only 40 minutes from the Orlando International Airport (from its South Exit), and a stone's throw from Interstate 4, the Omni can easily become a favorite for locals and visitors alike. The resort contains everything you need for several days, but if you still want to get away, just walk 1/4 mile to a nearby shopping plaza that offers several other dining and shopping options. If you simply must include a visit to Orlando's attractions, Walt Disney World, Universal Studios and Sea World are no more than 30 minutes away. 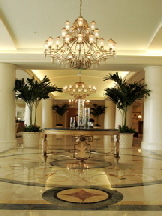 If you don't have your own transportation, the concierge can assist with transfer arrangements. David Leadbetter Golf Academy - www.davidleadbetter.com or call 407-787-3330.